They smoke because it is an addiction. It is a s simple as that. With the price of cigs nowadays people would quit just to save the money, but they can't. I don't believe a doctor or anyone else can make or get you to quit, quitting is something you have to do on your own, when you arre ready and when you want to. 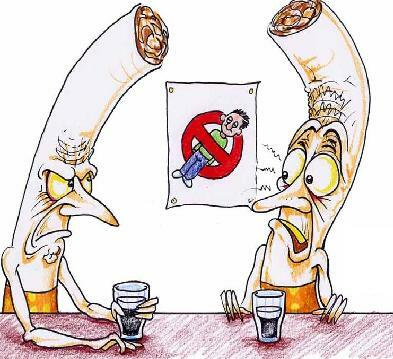 I smoke, have for nearly 40 years, it is an addiction and not an easy thing to stop, I snoke because I like to smoke, but it is getting to the point that the cost is getting out of hand, my opinion, half the world( none smokers) have decided that they run the world and going to make the smokers so merisible that they wil finally give up, I do blow smoke in people's face, I leave the area where othere non smokers are, I dont having to get up and lave a resturant to have a smoke, I do all that I can do to not bother others, and I think they should leave me and my habit alone. When others start paying for he auto I drive or the payments on my house then they can dictate what I do. There was a resturant here that made it so non smokers stayed inside and smokers set outside , that wasn't good enough, one non smoker complained they should be allowed to sit outside, only because they was going to mess it up for the smokers. That is the problem too many people in too many other's business, I do not like people that have no reguards for others, that will stand in the door way of the hospital and smoke and blow it on the ones coming or going, I don't like smoke when I'm eating and was glad when they pasted the law to out law it in resturants, I don't think people should smoke in a closed car with small children in it, but there are others who could care less, it is the ones that try to do right that gets the he*ll from the ones that are trouble makers. I have tried to quit, I even had a massive heart attack, and while I'm sure it did not help the situation, the heart doctor said my smoking did not cause it, STRESS did, I can't quit because I don't want to quit, and I don't want anyone telling me I have to. They stopped people from smoking in bars here, anyone knopws that barrooms are full of smoke, so if it bothers you why go there, seems to me an awful lot of people bring it on their selves.